There was a buzz all day around Wrigley, the renovations on display, the excitement of a team favored by many to win a World Series, celebrating an NLCS appearance from last year, there was no possible way the Cubs could match that buzz right? Wrong. For the majority of the night it seemed like the Cubs were destined to fall flat, in fact they were getting no-hit deep into the seventh inning before a David Ross single gave them some life. Brandon Finnegan kept the Cubs off balance all night but ran out of gas after 7 and 2/3 innings of no-hit baseball; it was a brilliant performance, but ultimately a no decision. 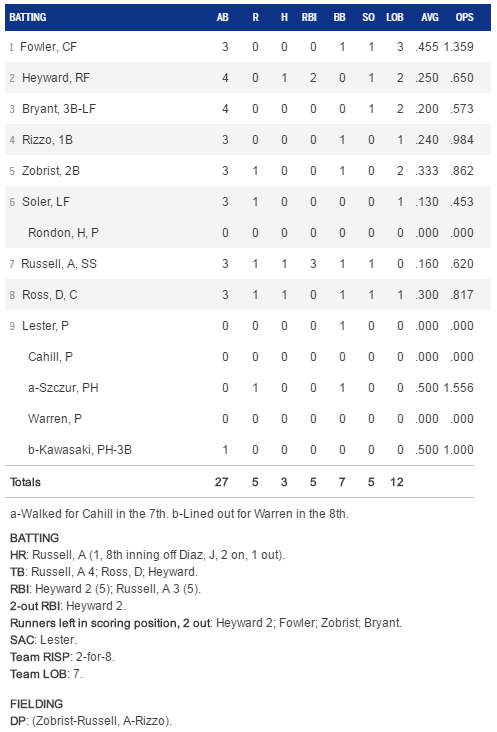 After the David Ross single in the 7th, Matt Szczur followed with a walk, and two batters later Jayson Heyward had his first big moment in a Cubs uniform. Tony Cingrani left an 0-2 fastball out over the plate and Heyward laced it into right for a two-run single and the once flat Cubs seemed to have grabbed all the momentum heading to the 8th. Ben Zobrist walked with one out in the 8th, and Jorge Soler was then hit by a pitch to set the stage for the youngest player of the group, Addison Russell. Russell wasted no time as he launched the first pitch he saw deep into the night to give the Cubs a 5-3 lead, and that’s how this one would end. A season that has exceeded even the highest of expectations so far just added another chapter. Lost in the late game heroics was the work of Jon Lester, he clearly didn’t have it last night, but was able to keep the Cubs within three through six innings as he picked up another quality start. No baseball today as we all recover from what was a long day of excitement yesterday; the Cubs are 6-1. Jake Arrieta does plenty to help the Cubs win every day that he takes the ball, now he’s helping them win by launching 440’ bombs with his bat. It seems that the reigning CY Young award winner can do no wrong as he tossed seven strong innings in Arizona, and smacked a two-run dinger to propel the Cubs to a 7-3 victory on Sunday. Thanks in part to the Arrieta bomb the Cubs built an early 3-0 lead before seeing the Diamondbacks square up a few balls, something that is definitely rare against Jake. A home run from Paul Goldschmidt started a two run third inning, and a solo shot from Socrates Brito evened things at three. Jorge Soler owns Shelby Miller, and he got him again yesterday as hit a sky scraping solo shot to give the Cubs a 4-3 lead in the sixth en route to a 7-3 win. Justin Grimm and Neil Ramirez were fantastic out of the pen to allow the Cubs to push their record to a sterling 5-1 on the young season as they head back to Chicago for the home opener tonight. What a win, and really great to see Jorge Soler with a big hit, and Anthony Rizzo with a career night. It’s only May 6th, feeling okay? This series has been a roller coaster of emotions, and tonight we can all breathe a little easier as the Cubs just barely hung on to beat the Cardinals 6-5. Both teams scored in alternating innings until the eighth when they both pushed across a run. Jon Lester didn’t do himself any favors as he made an error which led to an unearned run, which was not the only unearned run of the night. The Cardinals got two more after a two out error by Addison Russell, but Lester battled all night. The newest ace of the Cubs was able to work through seven strong innings before watching the bullpen shut the door, I wouldn’t say they slammed it, they shut it quietly. Nice to be out from under that losing streak, and the Cubs can now go for the split tomorrow afternoon. Chris Coghlan was plugged into the two hole tonight, he did his job by getting on base, he didn’t have any hits but he walked twice. Anthony Rizzo is hunting down the MVP, he was 2-for-4 with his fifth dinger of the year, three RBI’s, and a run scored. Kris Bryant continues to produce, he was 2-for-4 with a double, an RBI, and two runs scored. Jorge Soler seems to be coming out of his slump, he was 2-for-4 with an RBI in the win. Dexter Fowler, Starlin Castro, David Ross, and Addison Russell all chipped in with a hit. Jon Lester was gritty tonight, he worked seven innings, giving up four runs, one earned, on seven hits while walking two, and striking out six. Pedro Strop had another shaky outing, he worked one inning, giving up one run on one hit while walking one. Hector Rondon walked the tightrope as well, he worked a scoreless ninth for his sixth save of the year. He surrendered one hit while walking one, and getting one huge strikeout. Well, that was fast, under two and a half hours roughly. Jason Hammel was outstanding tonight as he completely shut down the Pirates from the first pitch as the Cubs took the series opener, 4-0. Hammel went eight shutout innings, and was never really in trouble as he only allowed four base runners, all hits, no walks. The Cubs got their runs from likely sources, Anthony Rizzo drove in two runs as did Kris Bryant. All four runs were driven in with two outs, you can’t really measure how important those hits are. With the shutout win the Cubs have now won three straight, and have improved to 11-7 on the year, mighty impressive. Dexter Fowler got things going from the lead-off spot again, he was 2-for-3 with a walk, a stolen base, and a run scored. Jorge Soler broke out of his recent slump, he was 2-for-4 with a double, and a run scored. Anthony Rizzo continues to be a machine, he was 2-for-3 with a walk, a double, two RBI’s, and a run scored. Kris Bryant is racking up the RBI’s, he was 2-for-4 with two RBI’s in this one, and he has knocked in nine so far this year. 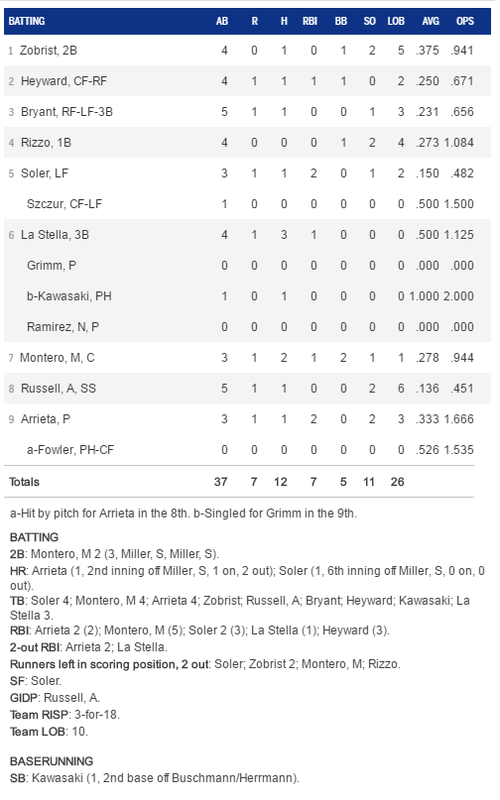 Miguel Montero, Starlin Castro, and Addison Russell all had one hit in the win. Hammel Time! Jason Hammel was stellar, he worked eight shutout innings, giving up four hits, he didn’t walk anybody, and struck out seven. Pedro Strop shut the door in an uneventful ninth, he worked a scoreless inning while striking out one.